Bruno Mars has been an up-and-coming singer for a while, but he seems to be transitioning into an established performer without many glitches. Just last year the twenty-six-year-old performer, whose birth name is Peter Gene Hernandez, was up for seven Grammy Awards; he managed to nab Best Male Pop Vocal Performance. Now, he’s gotten himself some swoon-worthy digs to house his growing collection of trophies. The property Mars just bought for a bit over $3 million is in the highly regarded Laurel Canyon section of Los Angeles, California. That neighborhood has been home to several American music giants — Joni Mitchell among them. The location seems extra fitting given the successful run Mars has had as singer and songwriter. 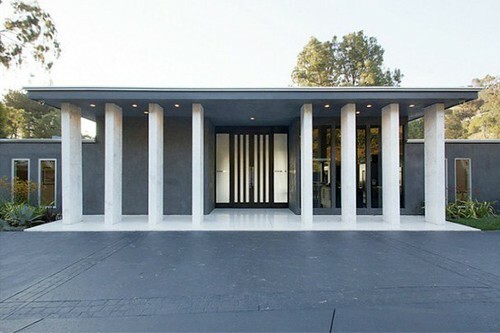 Mars’ new home is roomy at 4,064 square feet, and George Clooney’s pad is not too far away. For all that space, it’s modestly designed with three bedrooms and 3.5 bathrooms. A pool could not be missing, of course, nor could wonderful city views; the house delivers on both. Some commentators are having a field day with an architectural detail of the property: the height of its front doors is 11 feet. This would normally be no big deal, but it seems that being 5’5, as Bruno Mars is, means being labeled “short,” at least for a guy in L.A. It’s doubtful Mars will be affected by such squabbles.